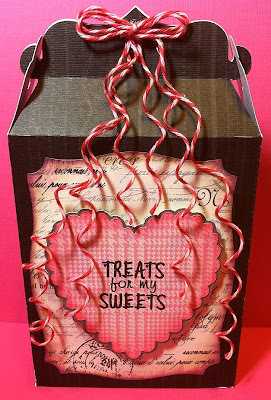 So for my project I decided to create a little treat box for my hubby for Valentines day :) I cut the box and the background from Spring Holiday Cards. The heart is cut from Sweethearts and the stamp is from Jaded Blossom "Valentine Treats" stamp set. Do you want to win a twine sampler pack? very pretty box you should enter this at decorate to celebrate for the valentine challenge. Wow! What a great idea! I had no clue you could "curl" the twine. Thanks for a great tip! very cute project. thanks for the tip on how to curl the twine. Love the treat box! 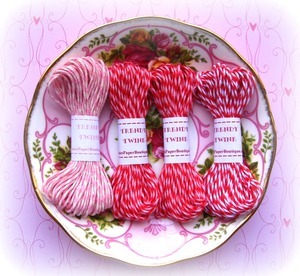 That Cherry Cupcake twine is yummy! Great color combo! Super cute box. Already a follower. Thanks for the instructions to curl the twine. It looks awesome. I have wanted some trendy twine for so long! Seeing this only confirms that I NEED it! So cute! Cool! I didn't know that twine curls! Thanks for sharing and thanks for the chance to win! LOVE your valentine box. It is so cute. What a clever idea to curl the twine!! I never thought of it and I use the same method for curling grosgrain ribbon for korker bows for my girls. Another great way to use twine!! TFS! I am a new follower! LOVE your treat box you made for your hubby!!! super cute!!! love the way you made the twine curl WOW! Love your project and twine! What a great tip about curling twine! Thanks for sharing! Super cute project, I love how you curled the twine, that is so creative! Love this little treat box! Thanks for the tip about curling the twine. I will definitely have to try it! !